Injuries are undeniably one of the worst parts of football, but the long offseason gives most players plenty of time to heal up before the new season. For fantasy football players, that long wait — coupled with recency bias of “injury prone” labels — leads people to underestimate players returning from injury. Generally speaking, the 2018 season was much, much better from an injury perspective than previous years — especially 2017. But there were still some big fantasy names that missed serious time. So which players injured for all or most of the 2018 should you keep an eye on in 2019? First-ballot Hall of Famer Jimmy G played just three games for the 49ers before being knocked out with an ACL tear. He was drafted as a tentative tail-end QB1 in fantasy leading into 2018, and I’d expect him to be in that range again in 2019. 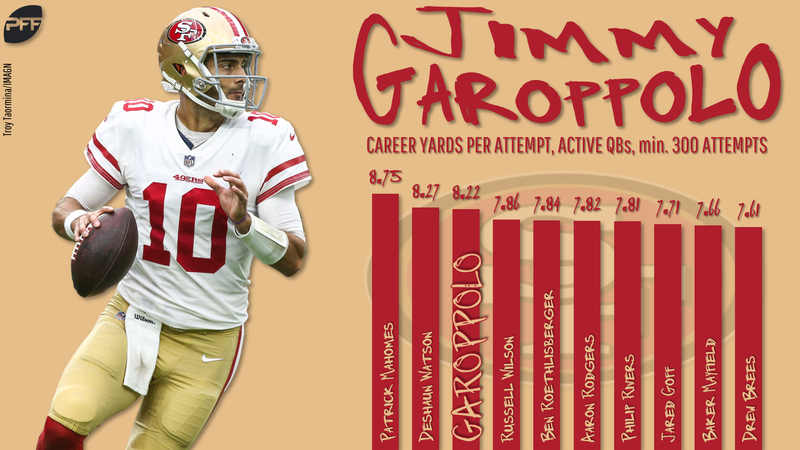 Garoppolo has a career YPA of 8.2 and will return with Kyle Shanahan and a 49ers offense that now features All-Pro tight end George Kittle. Remember McKinnon? He was a Round 2 fantasy pick back in August. He’ll still be a prime age in 2019 — just 27 years old — and all of the things that made him attractive leading into 2018 will still be true. Garoppolo is under center, Shanahan is calling the shots, and the fill-in combination of Matt Breida and Jeff Wilson Jr. had some big fantasy weeks in McKinnon’s absence. Exactly what San Fran’s backfield will look like in 2019 remains to be seen, but assuming McKinnon is scheduled to lead the pack, he’ll be a no-brainer RB2. Guice missed his entire rookie year, but he’ll still be just 22 for the 2019 season. Adrian Peterson is a free agent, but he might return to Washington as insurance. Even in that case, Guice would likely handily lead the backfield, as Washington spent a second-round pick on him in 2018. And though it was just one play, Guice’s first NFL touch was a 34-yard run with a series of broken tackles. He’ll be on the RB2 radar. 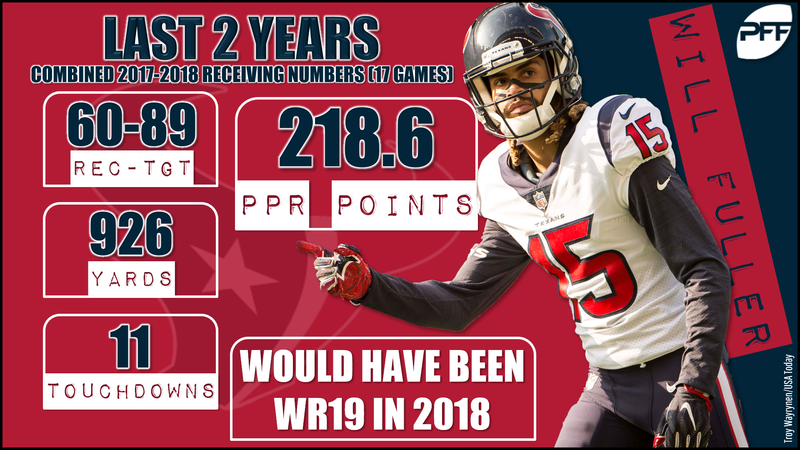 Fuller’s touchdown production predictably dropped from his absurd seven scores on 28 receptions from 2017, but he still scored four times on just 32 catches in 2018. He also averaged over 15 yards per reception for the second straight year and was on pace for a 1,000-yard season. Fuller is a WR2 with week-winning upside as a premiere deep threat and Deshaun Watson at the helm. Though he played only seven games in 2017, Fuller topped 100 yards in three of them. Kupp played just half the season, but he was on pace for over 1,100 yards and 12 touchdowns as Jared Goff’s safety blanket and favorite red-zone target. His 15 red-zone targets put him on pace for 30 for the year, which would have led the team. Lee, who was favored to lead the Jaguars’ receiving corps, missed the entire 2018 NFL season. He showed possible breakout potential in 2017, catching 56 of 91 targets for 702 yards and three scores. There are plenty of question marks surrounding Jacksonville’s offense — namely at the all-important quarterback position — but the group of receivers remains unsettled, so there’s still room for Lee to assert himself as the top dog. Henry was supposed to break out in 2018, and while that didn’t happen because of injury, he’s definitely going to be one of the top breakout/rebound candidates in 2019. Henry collected 12 touchdowns from 2016-2017 while playing second fiddle to Antonio Gates. As the main man in 2019, Henry will shine. The Chargers have a potent offense — just five teams scored more points than them last year — and all of their key pieces are returning. Henry will be a welcomed addition to a tight end position that sorely lacks depth for fantasy purposes. 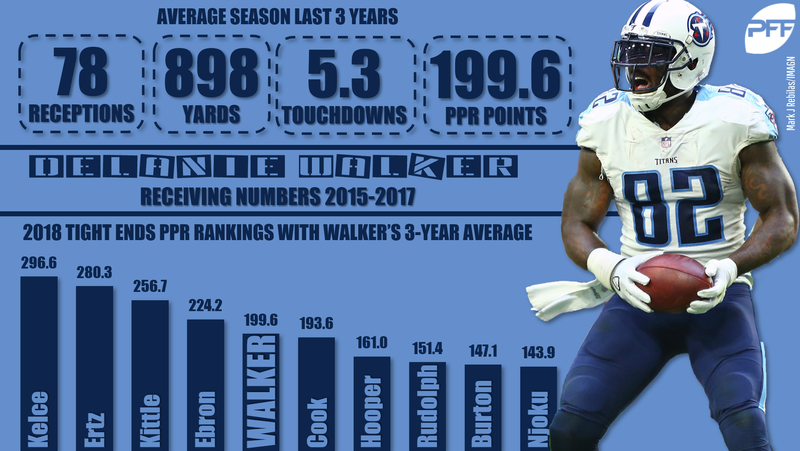 Walker is getting long in the tooth — he’ll be 35 when the 2019 campaign begins — but he had carved out a solid role for himself as Marcus Mariota’s most reliable target from 2015 to 2017. In that three-year stretch, Walker averaged 78 receptions, 898 yards, and 5.3 touchdowns per year. Walker is getting older, Mariota isn’t progressing as a passer, and the Titans offense looked brutal for most of last year, so I’m not here to say Walker will return to those heights. However, he will be on the tail-end TE1 radar if he returns and would be a leading weekly streamer candidate.